As a brewery and distillery, we're in one of the oldest industries known to man, but we're also a 21st Century start-up operating in the heart of the innovation and technology of the San Francisco Bay Area. So it’s natural for us to embrace that ‘disruption' buzzword. Seven Stills Brewery & Distillery, the San Francisco producer of high end craft beer and small batch whiskey distilled from beer, announces today a first-of-its-kind “Initial Can Offering” fundraising campaign. Seven Stills’ “ICO” aims straight at the start-up’s neighboring SF/Silicon Valley culture, adding gamification to an online crowdfunding campaign, with a little crypto homage thrown in for good measure. On July 11, the company will launch an ambitious crowdfunding campaign while simultaneously releasing it’s ICO India Pale Ale beer. 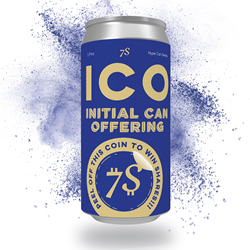 Each beer can comes packaged with a token that grants the owner up to 100 free shares in the company for every minimum investment made. Seven Stills seeks to raise $1 million through the campaign, at a price-per-share of $10 and minimum investment of $500. Proceeds raised from the effort will go into opening the company’s new 18,000 sq. ft. flagship location at 100 Hooper St, in the heart of the City’s booming Mission Bay and Design District neighborhoods. The new site rests just steps from the new Golden State Warriors arena, amid the emerging UCSF medical center, and will occupy the ground floor of the new headquarters for Adobe Systems. The goal of using a crowdfunding platform is to extend the raise beyond accredited investors and to the general public of beer aficionados and everyday consumers. Since its inception in 2013 as the proverbial garage start-up, Seven Stills has grown from an inaugural 30-gallon whiskey batch to today being on pace to produce 5000 barrels of beer and whiskey combined. Revenues have doubled annually, from $100K in 2014, to $250K (2015), to $600K (2016), to $1.2M (2017). The company is currently on pace for $3.5M in 2018, smashing original projections of $2.14M. Seven Stills is now projecting 2019 revenues to reach $9.7M, boosted significantly by the addition of the new 100 Hooper St. facility. The new site will include 8,000 sq. ft. of additional production space, with the remaining 10,000 sq. ft. housing a full cocktail bar, restaurant, retail area, outdoor beer garden and private members-only lounge. Seven Stills Brewery & Distillery was founded by Tim Obert and Clint Potter, two college friends who decided to try their hand at distilling some of their home brewed beers to see what happened. After some research and a lot of trial and error the two developed what would become Seven Stills’ flagship whiskey: Chocasmoke. Made from a chocolate oatmeal stout, it laid the groundwork for what the company would seek to do over the years and ultimately won a gold medal at the World Spirits Competition in its first year of production. Seven Stills does not use seven pot stills (we still just have one). Rather the name is an homage to the original seven named hills of San Francisco. The company opened its flagship brewery & distillery in 2016 after several years of nomadic home production on rented equipment. Now with three locations and over 50 beer and spirits varieties, it is the fastest-growing brewery or distillery in Northern California and the only facility in the country to be both brewing and distilling at the same location.